A majority of Romans’ diets consist of pasta and wine. For those of you who enjoy these listed items, your day will consist of a never-ending food coma cycle in Rome, Italy. But there must be more to Italy that pizza, pasta, and wine, right? Of course! Today, we will be ROME-ing around Rome as a local. First, start your day off with a warm cup of caffè espresso or caffè macchiato at a local bar. You can choose to either sit down or stand up, and feel free to order a pastry to go along with it. However, if you do choose to sit down, be aware of the fee you will be charged to sit in their bar. Sometimes, locals tend to order some sort of pastry with an espresso, but they never order one if they are drinking a drink that contains milk, such as a cappuccino. If you do this, locals will look at you funny. 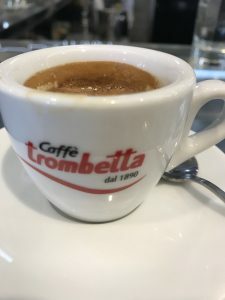 Unlike in the United States, Italy’s espresso is served in a tiny cup that holds a small amount of coffee, so don’t be alarmed if they serve you a tiny coffee cup! You have been exploring and walking around Rome all day and it now around noon. Your stomach is rumbling and you are looking for a place to eat. 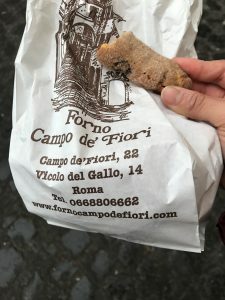 Forno Campo de’ Fiori is the place to go to for pastries and to buy pizza that is traditionally sold by the weight. They have a wide range of pastries and pizza to choose from at an affordable price in a friendly environment. My go-to pastry is their crunchy tozzetti, it is delicious. A few hours have passed and you have decided you want something sweet. Gelato is a must if you are in Rome, especially at Giolitti. 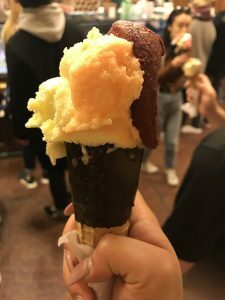 Giolitti is a few minutes walking-distance from the Pantheon, and it is also my personal favorite. Their usual busy hours is around lunch time and the lines can get really long. Therefore, I recommend going later on in the afternoon. Although, every hour is gelato hour in my book! The day is now coming to an end and you have seen and done it all. You visited the Vatican, you went to the Colosseum, you walked across the Tiber River, and so forth. You want nothing else but to have a nice, relaxing sit-down dinner, but you want to change it up a bit from the regular pizza and pasta routine. 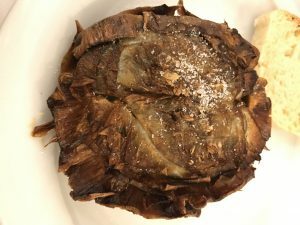 Going to a restaurant located in the Jewish Ghetto and ordering a Jewish-fried artichoke as a starter is one way to live as a local in Rome. There is nothing like this dish and it is unique in its own way. It is definitely something to try before heading back home. This is only a few of the many ways to live as a local in Rome. Rome, itself, is a big city that is bustling with adventure. There is always something new to see and experience at every corner. Chantal is a SAI Rome spring 2018 student from Saint Mary’s College of California.